Cutting the line to release a tagged white shark. Credit: Joe Mello, NEFSC/NOAA. A record number of sharks were found during NOAA's coastal shark research survey along the U.S. East Coast in 2015. 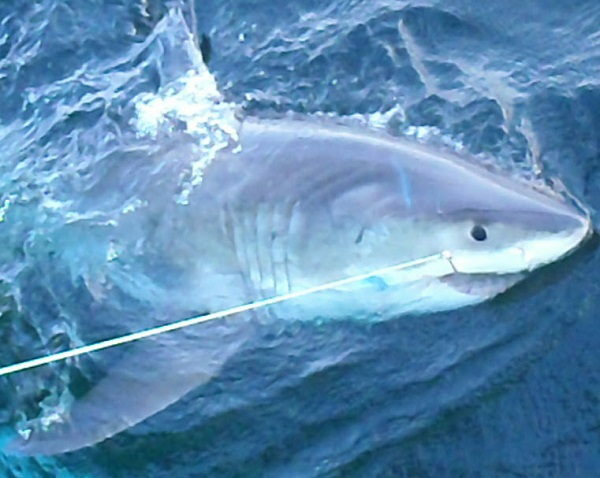 More than 2,800 sharks were captured and tagged - the most in the survey’s 29-year history. Researchers say that these results are very good news for shark populations. This year, the survey was conducted from Port Royal, South Carolina, from April 4 to May 22, and from just south of Ft. Pierce, Florida to North Carolina. The surveys are conducted in the 5-40 fathom (30 to 240 feet) depth zone with most sampling between 11-20 fathoms (66 to 120 feet deep) and use commercial Florida-style bottom longline fishing methods to standardize survey results. This method uses a long, or main, line with baited shark hooks spaced at regular intervals along the line. Most (2,179, or 77%) of the sharks captured were tagged and released, 434 (15.3%) were brought aboard, and 222 (7.8%) were released untagged or lost. Researchers do not intentionally kill any animals for their studies. However, some sharks do not survive capture, and these were carefully dissected at sea to obtain biological samples important for studies on shark age and growth, reproduction, and food habits. On this survey, reproductive information was obtained from 170 sharks, backbones were removed for age and growth work from 109 sharks, and stomachs were examined in 82 sharks. The scientists also collect parasites, DNA and blood samples.